Valentine's Day may have passed but we're celebrating all week by sharing the love. 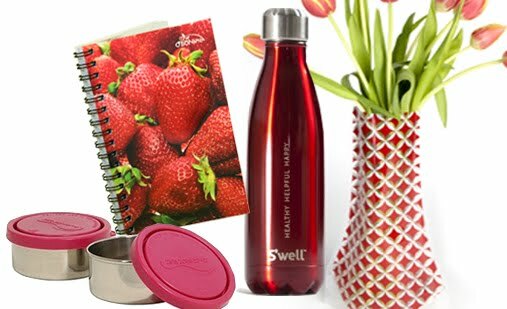 In lieu of sending you - our friends - flowers and chocolates, we're spreading green love in our own lavish way, with a great Green Valentine's Gift Giveaway! 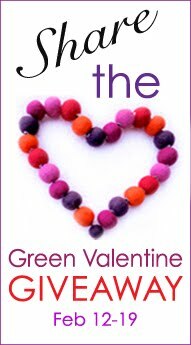 You could win a fabulous prize package of green Valentine's Gifts ideal for use the whole year long and worth more than $80. The great part is, the winner will be able to have one item from the package sent to a friend who's also entered - and share the love, with our compliments! We believe in paying it forward. Win and so does one of your friends. Simply tell us what green things you LOVE to do and you could win a prize package of eco-friendly gifts that keeps on giving. 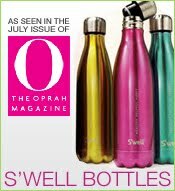 WIN and you'll receive one of our hugely popular, Oprah-approved S'well Stainless Steel Insulated Water Bottles - the sleekest steel bottle around and in your choice of colour. There's seven to choose from. Kids Konserve Leak Proof Stainless Steel Food Containers 2-Pack - perfect for everything from luscious strawberries to yoghurt and more, choose from pink lids or brown. Collapsible Recyclable Flower Vase - ideal for those Valentine flowers and five styles to choose from. O'Bon Strawberry Sugarcane Notebook - write your thoughts, plan your day, make notes of any kind on spiral bound lined paper made from sugarcane pulp fronted by high definition strawberries that look real enough to eat. Hopscotch Kids Red Rover Nail Polish - paint those little fingers and toes without any nasty chemicals. 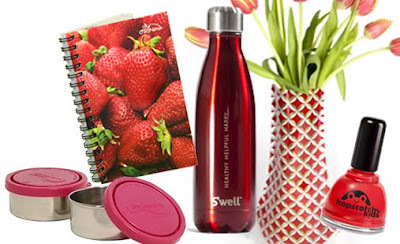 If you win, you can choose which of these items is sent to a friend or loved one - free of charge. Tell us what green things you LOVE to do and you could win all the green Valentine's gifts detailed above in our random draw. SHARE IT & WIN TOO! We really want you to win something! Share this giveaway with your friends -- if they win, so can you. The winner will be able to choose a friend to receive one of their prize items and we'll ship it free of charge. To receive the item, the winner's friend must have entered this giveaway as well. It's a win-win, so pass it on. Leave a separate comment below for each thing you do. The winner will be chosen in a random draw. Deadline for entries is midnight PST Sunday, February 19th. The winner will be notified by email Monday, February 20th. Open to Canadian residents only. The prize item for the winner's friend will be shipped to a Canadian address only. I love to be cozy under blankets which makes it easy to not have to crank up the heat! I also love to be in nature, walking through the forest or near the ocean. I follow @LavishandLime on twitter, I have for a long time and will continue to do so!! I like a cozy blanket and subdued (or no) lighting when watching a movie...(in this old house on a cool night when the thermostat has been turned down for the night). We shop local, buy 90% used, refuse large amounts of packaging, use reusable containers, etc etc. Liked on FB too! I love using organic cleaning products and making my own body wash. I liked your post on FB. I recycle, buy consigned clothing, use a programmable thermostat, run errands in groups to conserve gas, and eat meatless once a week. I'm still a facebook fan of Lavish & Lime under username Jennie Tilson. I like the post about this giveaway on the Lavish & Lime Facebook page under username Jennie Tilson. I like reusable containers for lunches; and compostingour food scraps. I liked your FB post. I like a post about this giveaway on your FB page. We only have lights on in the rooms we're in and use nightlights in the hallways. Usually the only light may be the TV. Liked another post about this giveaway. I love to be outdoors with my three girls and teach them about the plants, bugs and birds we see like my Dad used to do with me. I love using cool cloth bags everywhere I shop...they are fun to look at & easy to use. My daughters and i love to compost all our scraps off food. We have a compost bin and my girls take a daily bucket down to the compost. When the bin is full the girls love to empty it and spend hours digging out the worms and playing with them. Its a great way to give back to the earth and a great way to teach the girls about giving back to the soil! I design and build eco-friendly homes (solar power, geo thermal heating, air heat pumps etc.) and I love it! I also love to be in nature and out on the water and have recently taken up paddle boarding. I love to repair stuff rather than buying new - it means less waste and less shopping, and I often learn new skills from it. We turn off lights when not in use and use energy saving bulbs. Keep heat turned down. Always save clothes for donation after we outgrow them. Recycle cardboard, and cans. Try to buy organic , if we can. We love to make handmade gifts! We use hand me down clothes, recycle, grow our own veggies, and use reusable bags. We're a little greener by - letting yellow mellow (we don't flush everytime we go); we keep our heat down (I can't stand it being too hot anyway); we use a toaster oven more instead of our large oven; we wash in cold water; we use only "green" cleaning products such as vinegar, baking soda, etc. ; we buy a lot of our regular needs at the bulk store to save packaging; we recycle everything we can and compost what we can't recycle (we're lucky if we put out a garbage can once a monty). I love going to theatre! we use a pellet stove now for heat, i walk instead of drive whenever possible, and we plan on having an even bigger veggie garden this year. I love to save tubes and wrapping from various products and reuse them for crafttime with my daughter. I love to get outside and snap photos. I would be happy if could that every day of my life. We have a programmable thermostat. It is set to go down at night and when no one is home during the day. We it's cold enough to plug in the car we have it on a timer so it's on for the shortest time needed. We use reusable bags at the grocery store and our lunches are packed in reusable containers. Like the post on Facebook. Julia G.
Have been a fan on Facebook a long time! I love recycling - I'm so excited that I just moved to a city with a municipal organic waste collection program! We try to do many "green" things on a daily basis, including reducing what we buy and reusing as much as we can. I'm already a fan of Lavish and Lime on FB! My oldest daughter has started school this year and every day we pack a litter-less lunch. We also use reusable bags whenever we can and re-use the plastic bags. Anything and everything that can be recycled or composted we do. My daughters use a lot of household materials in their crafts - I got a jewellry box made out of a tea box for Valentines day :-) Like most others we keep the temperature down in the house and wear sweaters or use extra blankets. we use cloth diapers, mama cloth, we recycle, we inform people who do not recycle about why it is important. we are vegetarian. we shop at thrift stores if we cannot repurpose another item. i sew. i knit. we make most of our food from scratch. i liked a post about this giveaway! my email is in my google / blogger profile. I love that we don't use chemicals in the house to clean, we enjoy the outdoors as much as we can and that we recycle just about as much as we can. A green thing I love to do is "upcycle". I love finding something and repurposing it rather than throwing it out. For example, the other year I made a purse out of upcycled materials. The hardware for the purse came from an old purse and the outside fabric of the bag was made from a canvas tank top! I recycle bottles, cardboard, paper, glass, and plastic. We compost. And we also use cloth diapers for our twins! I love to cloth diaper my son! I like Lavish & Lime on Facebook. I liked the third giveaway Facebook post. I like to save wrapping paper, gift bags, and ribbbon to reuse whenever possible. Old xmas cards can also be made into gift tags. Being creative and green at the same time! I still like you of Facebook.